Yakima County Prosecuting Attorney Joe Brusic said law enforcement officers do not have to enforce the new initiative on semiautomatic rifles such as AR-15s because his office won’t prosecute those cases anyway. “I don’t agree with this law and I am not going to prosecute someone under this law as it is now, with the wording that is has,” Brusic said Thursday. Yakima County Sheriff Bob Udell, Klickitat County Sheriff Bob Songer, sheriffs in Lewis and Ferry counties and Republic Police Chief Loren Culp all have said they will not enforce the new law. We now have sanctuary cities and counties. Assuming the stores play along you can buy your guns there. Just don’t flaunt it and you can ignore the stupid laws. In the mean time the cases filed by SAF and the NRA will work their way through the courts. This entry was posted in Current News, Gun Rights by Joe. Bookmark the permalink. 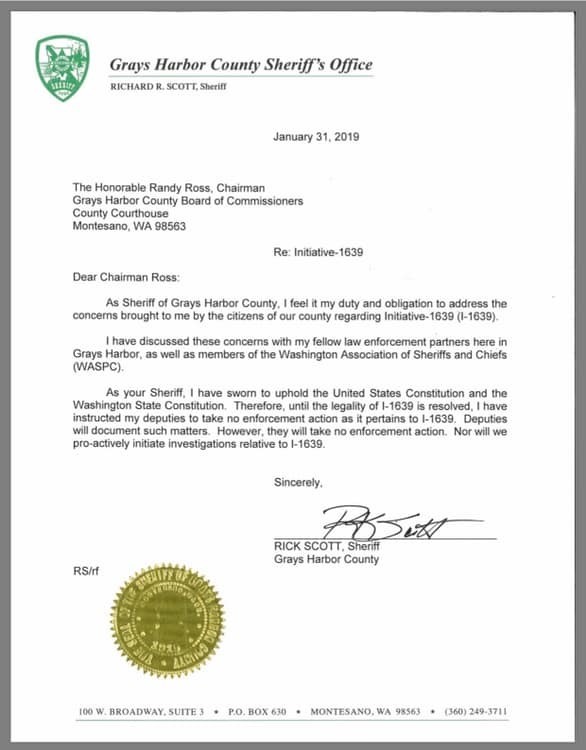 It’s nice to see someone who will openly call such a law wrong like some of these sheriff’s and DA’s are doing. The problem being that refusing to enforce a law does NOT make it go away. And eventually the left WILL get someone elected who WILL enforce these laws…..with gusto. Gov Sandoval and State AG Laxalt called the law unconstitutional and refused to enforce it. Fast forward to Jan 2019. We now have Demonrat Gov Sisolak and Demonrat State AG Ford ( a raving black racist) BOTH from that cesspool Vegas. And BOTH ON THEIR FIRST DAY IN OFFICE openly stating they are going to enforce this law and seek a TOTAL BAN on “assault weapons”. So while it’s nice to see such laws ignored that DOES NOT SOLVE THE REAL PROBLEM. The real problem? You mean mal-educated voters who elect these intolerant, bigoted meatpuppets? The Nevada initiative was not declared “unconstitutional”. The issue was that the initiative drafters – in order to make the claim that there would be no cost associated with the measure – provided that the background checks for the private transfers would be done directly to the FBI/NICS by FFL dealers. But Nevada is a Point of Contact state, meaning that dealers call to a Nevada state call center for interface to NICS. And the FBI stated that they would not accept direct dealer contact from a Point of Contact state by law. Bad laws make outlaws of good people, whether or not the law is enforced. The resultant breakdown of respect for all laws doesn’t lead to anything good, society-wise. While I honor the Sheriffs’ decisions independently, taken as a whole and with similar phenomena, it makes me extremely concerned for the next 20 years or so. The professor quoted in the article is either stupid or deliberately lying. 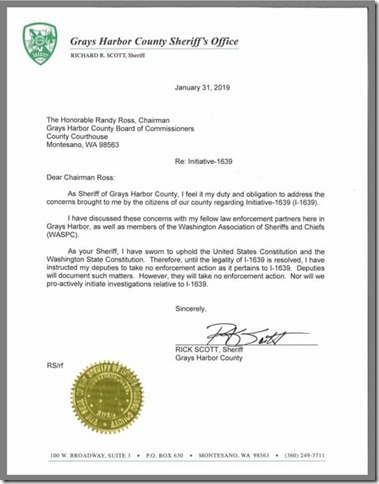 Washington State University criminal justice professor Craig Hemmens isn’t as sure about the absolute discretion of prosecutors and sheriffs. “I think it’s an open question whether they have that discretion,” he said. There are several laws on the books that aren’t enforced because everyone agrees they shouldn’t be — but not everyone agrees on this initiative, Hemmens said. So cops have the discretion not to prosecute unless not everyone agrees with them, and then they don’t? Similarly in Colorado, since the 2013 legislation that purported to “ban” 15+ round magazines in Colorado, there has been widespread contempt for the law. Outside of chain store gun counters, I would say that my informal survey of gun shops in the state show about 75% of shops selling 15+ round magazines currently. In fact, I was in one shop that is explicitly a police supply store and saw non-compliant magazines for sale hanging openly.